In the 1880s, there were hundreds of distilleries in Ireland, but they did not bottle their own spirit. Local grocers, who were legally bonded whiskey wholesalers, would arrive at the gates, fill their own casks with spirit, age it, blend it and sell it. J.J. Corry of the port town of Kilrush, County Clare, was a particularly enterprising bonder who experimented with finishes in the barrels he could acquire at the harbour - Bordeaux casks, port pipes and many more. In the 20th century, Irish whiskey declined, until by 1975, when there were only two distilleries left on the island, and no whiskey bonders at all. Louise McGuane is the first licensed bonder in Ireland in living memory. She ages new-make spirit in the rackhouse on the family farm in Clare, located just six miles from the wild Atlantic ocean. Unusually for Irish whiskey, the casks live the old-fashioned way, as they are supposed to, on their sides, raised off a dunnage floor and breathing an air rich from the sea, lush green grazing grass and the surrounding peat bogs. The barrels are selected and cared for by one of Ireland's last master coopers. 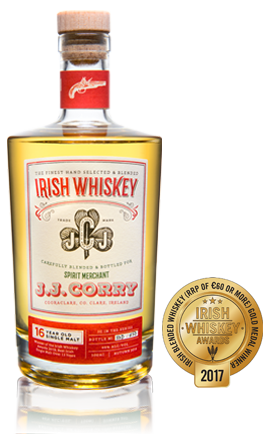 And the whiskey is named after McGuane's predecessor as a whiskey bonder in the area, J.J. Corry. The Gael is an award-winning Irish whiskey blended from 60% mature Irish single-malt whiskeys (from 11 to 25 years old) and 40% single-grain Irish whiskey (7 years old) to produce the fruity cornucopia you might expect from Irish whiskey but with extra levels of complexity from maturation in living oak. In the spirit of trust and transparency implied by the term "whiskey bonder", J.J. Corry openly states that this is liquid sourced from County Louth. The Gael is named after a bicycle invented and sold by the original bonded whiskey merchant J.J. Corry invented in the 1890s. J.J. was a keen cyclist and social secretary of the local club. Probably not surprising if he could bring whiskey like this to the meetings. 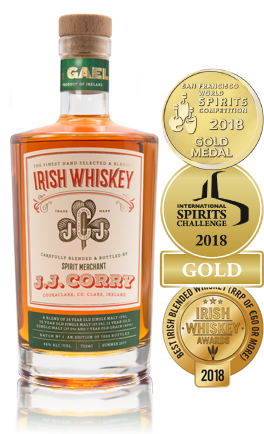 The latest release from Irish whiskey bonder J.J. Corry is a limited edition of 400 bottles of 16-year-old single malt Irish whiskey. It is the first true small-scale bonder's blend Irish whiskey in living memory. The Flintlock is an assemblage (in 1:1:1 ratio) of three partially disgorged ex-bourbon casks of 16-year-old malt whiskey from a single distillery, each with an individual but complementary flavour profile. The name of The Flintlock is a reference to the independent spirit of this innovative Irish whiskey maker. It is named after a 200-year-old pistol found during renovations to the J.J. Corry tasting room - part of the old farmhouse, which was built in in County Clare in pre-famine times and was long rumoured to be a rebel hideaway.